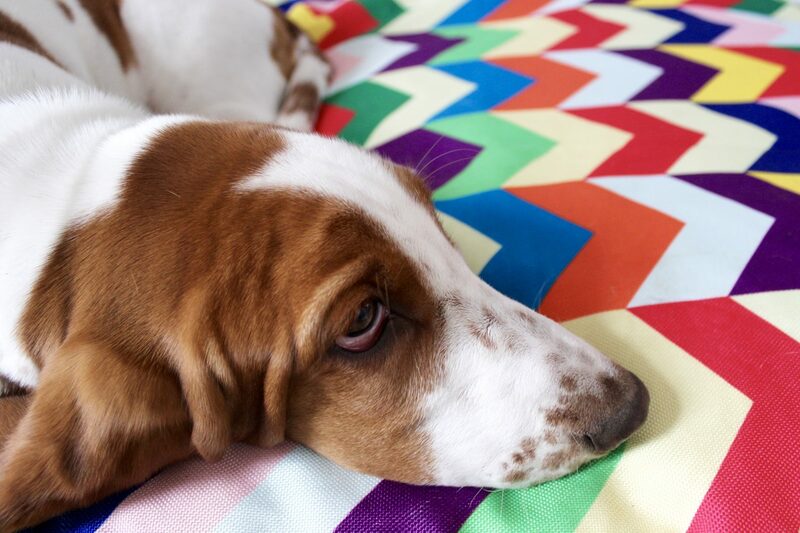 Our Basset Hound puppy Poppy is now five months old and we are already on to her third bed! What with her growing so quickly, chewing absolutely everything in sight and of course the inevitable toilet accidents. We’ve learnt that choosing the right bed isn’t quite as easy at may first seem. How does your dog like to sleep? Do they usually curl up in a ball or do they prefer to stretch out? Poppy tends to start off curled up quite tightly but soon stretches out. Her past two beds have been the doughnut style ones which are great for smaller breeds and dogs that like to curl up to sleep. As Poppy has grown we’ve realised that this style of bed isn’t best suited to her and we’ve now opted for a mattress style bed instead. 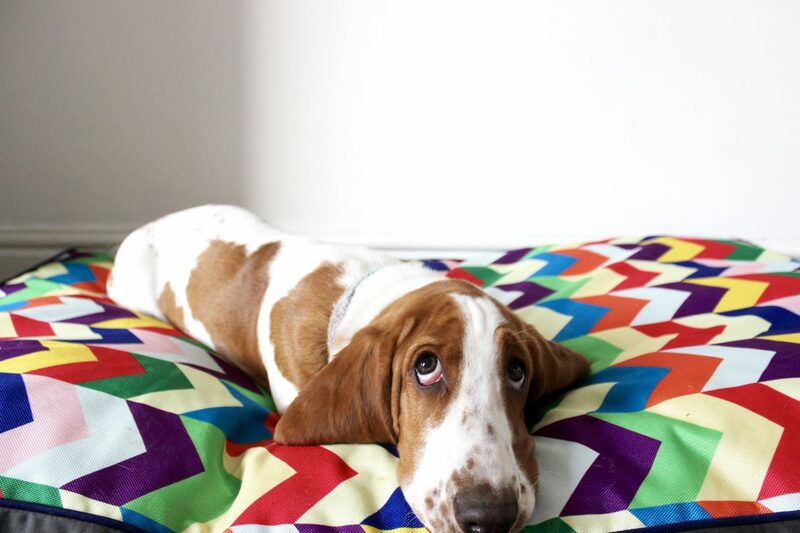 It’s important to consider how big your dog will be when fully grown and look for a bed that will still give them plenty of room to stretch out. Don’t get sucked into buying a tiny puppy bed, it’s just a waste of money as they will have outgrown it within a couple of months. It’s far better to invest in a quality bed that will see them right through to adulthood. Where will the bed be placed in your home? How big is the space? The bed needs to be somewhere that is warm and draught free so you need to choose a bed that will fit this particular space. Don’t make the mistake that I made with our last dog and buy a bed that is far too large to fit the space, always check the measurements! 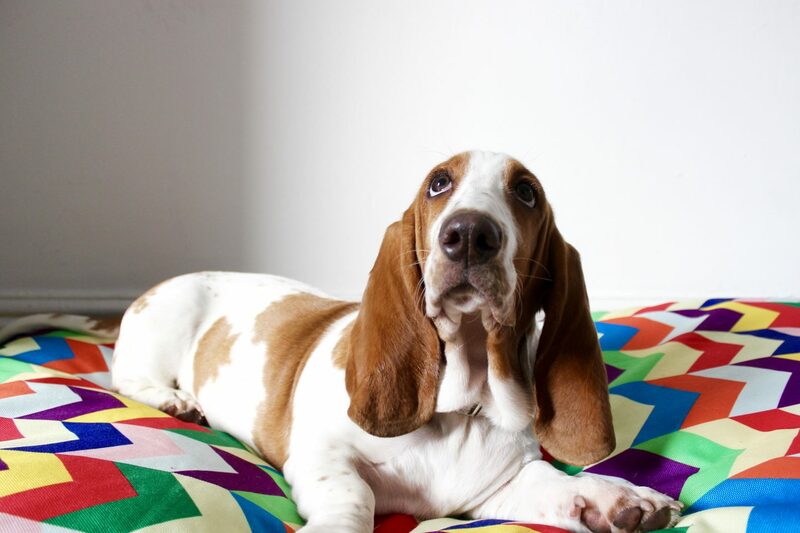 Your dogs bed fitting in with your home decor may also be important to you. You shouldn’t have to compromise on style. 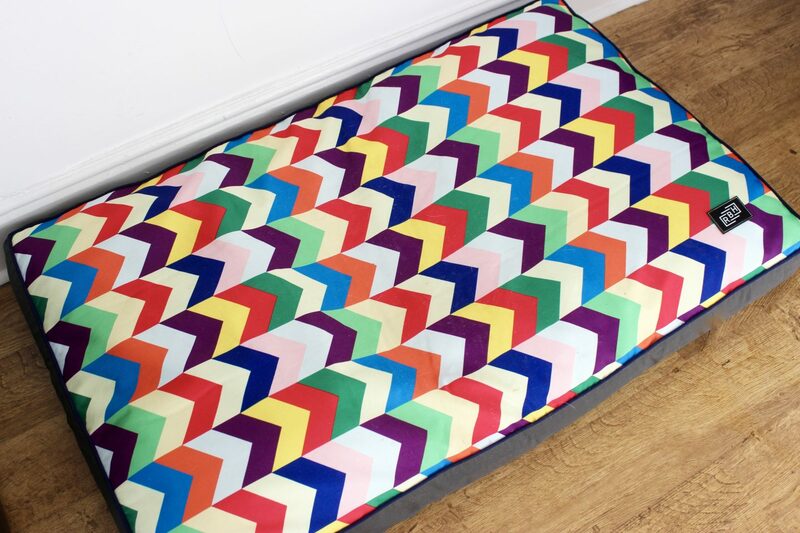 We are big fans of colour in our house, so Poppy’s new designer dog bed from Raised by Humans is perfect for us and our home. It is absolutely essential for us that Poppy’s bed has waterproof, removable and machine washable covers. When your dog is a puppy there will be plenty of accidents and you will need to wash the covers. Even when your dog is fully grown and toilet trained, they still get very dirty and we all know that dogs can be pretty smelly sometimes! So you’ll need to be able to wash their bed regularly to keep odours at bay. Finally and probably most importantly, make sure you invest in a good quality bed that will be comfortable for your four legged friend. Memory foam is a good option as it’s super comfy for your dog. Especially if you have an older dog who suffers from aches and pains, particularly in their joints. Poppy’s new bed is from Raised by Humans and both me and Poppy absolutely love it! 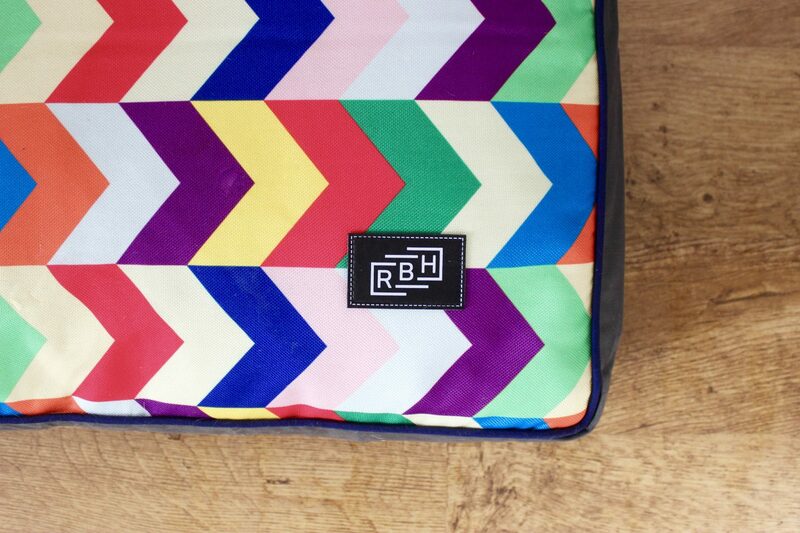 I really like the gorgeous multi coloured geometric design. And most importantly it’s really comfortable for Poppy. 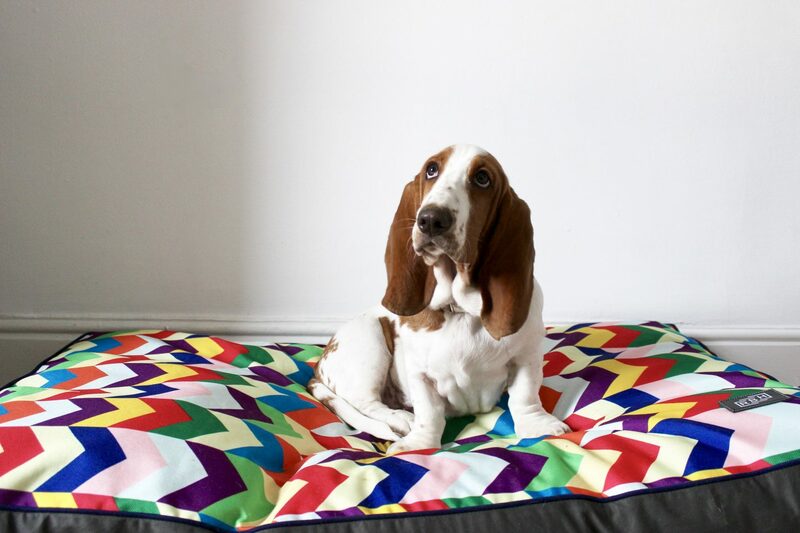 Raised by Humans beds also come in a doughnut style which might be better suited to your dog but we opted for the mattress style so that she can stretch out. 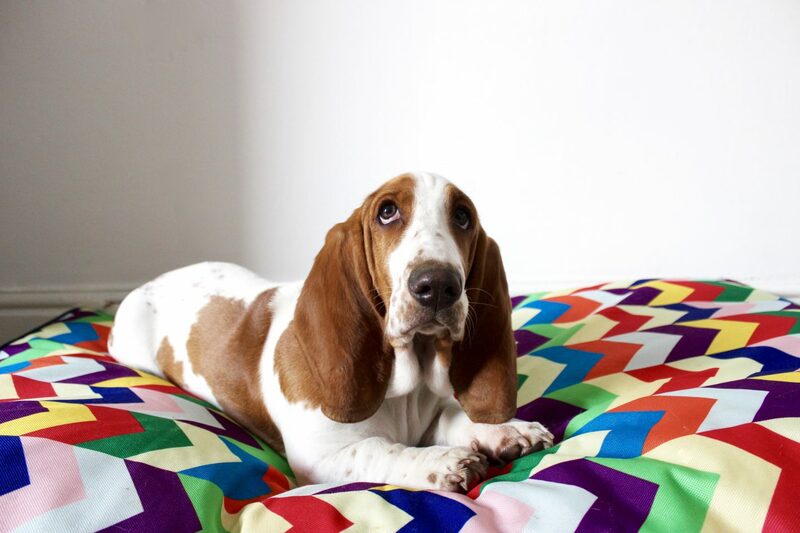 Raised by Humans began with a realisation – the pet industry is littered with dog beds that sacrifice design for convenience, or assume that luxury must always translate to tweed and tartan. Do we stop caring about the contents of our home when the furniture is for our pets and not us? What do you think to Poppy’s new bed?